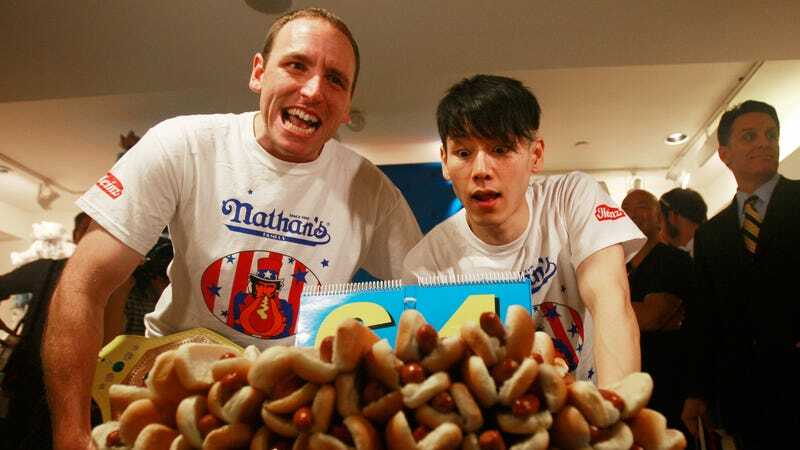 The rival in question is Takeru Kobayashi, a former champion now dwelling in “self-imposed exile” after departing the competition over a contract dispute with Major League Eating, the organization that runs Nathan’s Hot Dog Eating Contest. In the nine years in which Kobayashi and “Jaws” competed against each other, the former snagged the mustard-colored winner’s belt six times, and the latter nine. But Kobayashi hasn’t been seen at the annual competition since he rushed the Nathan’s stage after departing MLE, a stunt that landed him in jail. I would never have expected the world of competitive hot-dog eating to be so… salty. Regular human guy Mitt Romney: "I like hot dog best, and I like hamburger next best"